It’s exciting when someone has an abundance of produce and shares it with you. Normally we’re the ones with excess, but fruit trees (especially citrus) are something we lack. So when a new friend said her lime tree was producing prolifically and she was going to have to throw hundreds of limes in the bin if she couldn’t find someone who wanted them…well…we were happy to help find these limes a home! Many of them we’ve given away to customers with their orders, but we definitely were able to make use of many more in our own kitchen. Probiotic Limeade has been our go-to recipe for these lovely organic limes. You’ve probably heard of the benefits of consuming fermented products. We love our milk kefir and kombucha here. But limeade is a special treat, since we don’t often have bulk limes on hand. Bring about 2 cups of your water and the sugar to a simmer until the sugar is dissolved. Then turn off the heat. While waiting on the sugar, juice your limes and discard any seeds. 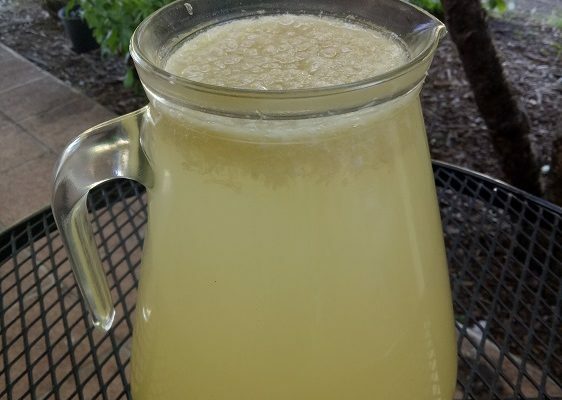 Pour your sugar syrup into a glass jug or the like (preferably made of glass or ceramic though…try and avoid plastics and metals), then add the enough of your water to cool the syrup if it’s still hot. How much water you use all up depends on the capacity of your jug or whatever container you’re using. I have a 3L glass jug, so used that. Add your lime juice and kefir grains. If needed, top up your jug with more of the filtered water. Cover your jug/container with a cloth (good idea to secure it with elastic or the like) and allow to sit at room temperature for about 3 days. Test the limeade periodically to see when it’s done. It will get slightly bubbly (more bubbly the longer you leave it) and the sweetness will fade a little. 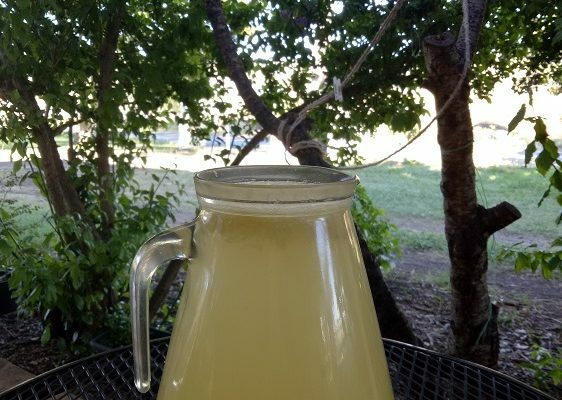 When you are happy with the result, pour your limeade through a sieve into bottles and refrigerate. Enjoy! It’s a highly refreshing beverage.